Location: NYC. Content: Leonard Nimoy , known for his roll in Star Trek as Spock. 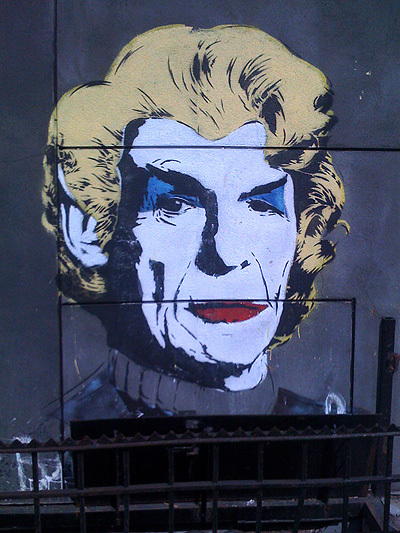 His portrait is put together with the hair and makeup of Marilyn Monroe. Here at UrbanStreetVamp.com, our mission is to unite street art and admirers from all over the world. Whether you chose to admit it or not, street art is apart of our culture, and in many cities, it is apart of every day life. We commend these artists for going out there and making our ordinary even more extraordinary. Got any cool photos of artwork from the street? Send them to us at UrbanStreetVamp@gmail.com. The views of the artists do not reflect the views here at UrbanStreetVamp.com. We do not claim any work posted as our own nor are we responsible for how it got there. We only wish to share photos of the street artwork you have collected with the rest of the world. If you know any additional information about photos you have seen on the site, feel free to post! Its good as your other articles : D, regards for putting up. “Slump I ain’t in no slump… I just ain’t hitting.” by Yogi Berra. Hey admin, I just wanted to give you a quick heads up that your current URL: http://urbanstreetvamp.com/?p=373 is being flagged as a possibly malicious web page in my internet browser internet explorer. I’d highly recommend having someone look into it. You can certainly lose a lot of readers due to this kind of problem. Best of Luck. I’m also writing to let you be aware of of the perfect discovery my girl enjoyed reading through your web site. She noticed a lot of things, which included how it is like to possess an incredible coaching heart to make most people really easily comprehend a number of tricky subject areas. You undoubtedly exceeded readers’ desires. Thanks for providing those powerful, trusted, informative as well as fun thoughts on this topic to Emily. Thanks man really nice site and some great articles, keep up the greatI was surfing google and I saw your website and it is very interesting, keep it up! I just added this blog site to my google reader, excellent stuff. I Cannot get enough! You made a few fine points there. I did a search on the subject matter and found the majority of persons will have the same opinion with your blog. It¡¦s actually a great and helpful piece of information. I¡¦m happy that you shared this helpful information with us. Please keep us up to date like this. Thanks for sharing. I went over this website and I believe you have a lot of superb information, saved to my bookmarks (:. I like what you guys are up also. Such clever work and reporting! Keep up the superb works guys I have incorporated you guys to my blogroll. I think it’ll improve the value of my site . I wanted to send you one little bit of word so as to say thanks again with the remarkable views you have documented above. It is so remarkably generous of people like you in giving without restraint all that a few people would have offered as an e book to make some dough for themselves, notably seeing that you could have tried it in case you considered necessary. The concepts in addition acted to provide a easy way to comprehend other people have similar dreams similar to mine to learn good deal more related to this condition. I am sure there are thousands of more fun instances up front for those who start reading your site. Haha much appreciated…but I’m not a famous blogger, just a digital artist trying to get by. Its hard to keep up with this now that I’m not in school anymore.